When the flat of farm fresh strawberries arrived on my doorstep (as part of our local CSA share) I knew that the time had come to make jam. Now I love jam, in all of its varieties. But what I do not love is making jam. There are always those certain kitchen tasks that one finds much less pleasant than others, and for me making jam is one of them. Granted, it isn’t very difficult, and doesn’t take all that long. But I personally often find the process hot and laborious. This does not, however, stop me from making numerous batches each year. Luckily for me, my friend agreed to come and lend a hand (read: do all the hard work for me) to make the process much more enjoyable. We started out with our fresh, almost too ripe, locally grown, organic strawberries. We then added freshly squeezed lemon juice (to really bump up that sweet but tart strawberry flavor), sugar, a little butter (to prevent foaming), and powdered fruit pectin. Very simple. 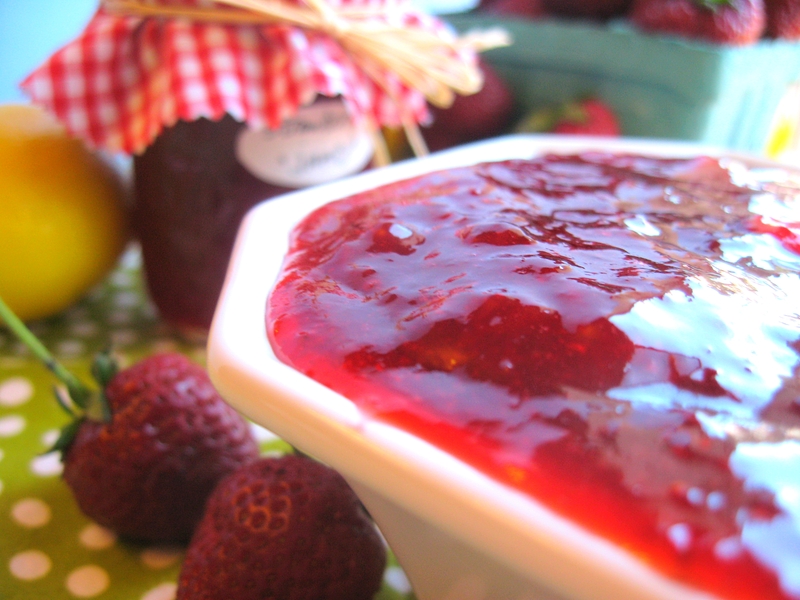 But in the end, you have a jam that is the very essence of the strawberry itself. Delicious on toast or biscuits, as a filling for crêpes, or even swirled into your favorite vanilla ice cream. It doesn’t get more old fashioned or homey than this. Add a simple red gingham skirt tied off with raffia, and you have a perfectly charming little hostess gift, that anyone is sure to love. Enjoy! For something you don’t like to do…you ROCK! Agh! That jar is adorable! 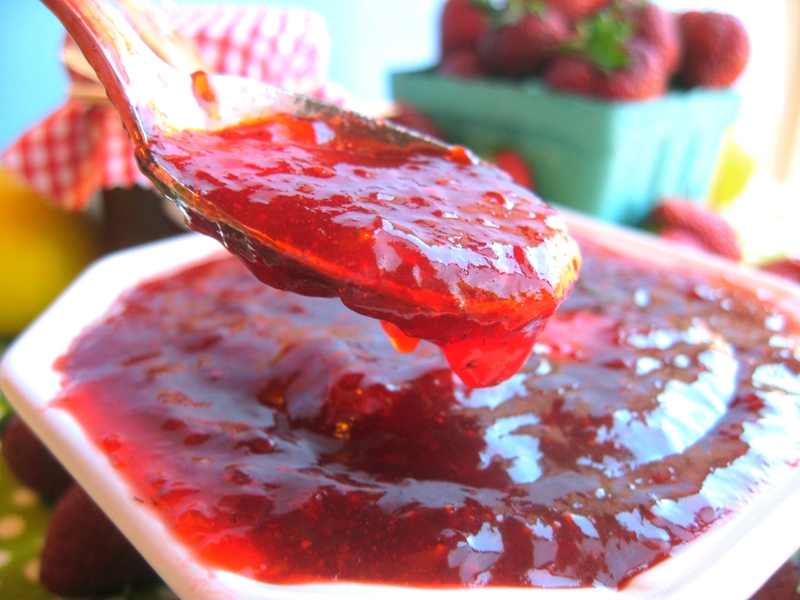 I just got some strawberries and am tempted to make more jam. We’ll see! mmmmm. Strawberry is my all time favorite. 🙂 So sparkly and pretty. I’m doing rosepetal this weekend! I love making jam. It is hot and labour intensive, but the smell is just so good! There is something so natural about making jam and such a soothing process. Yours looks wonderful! 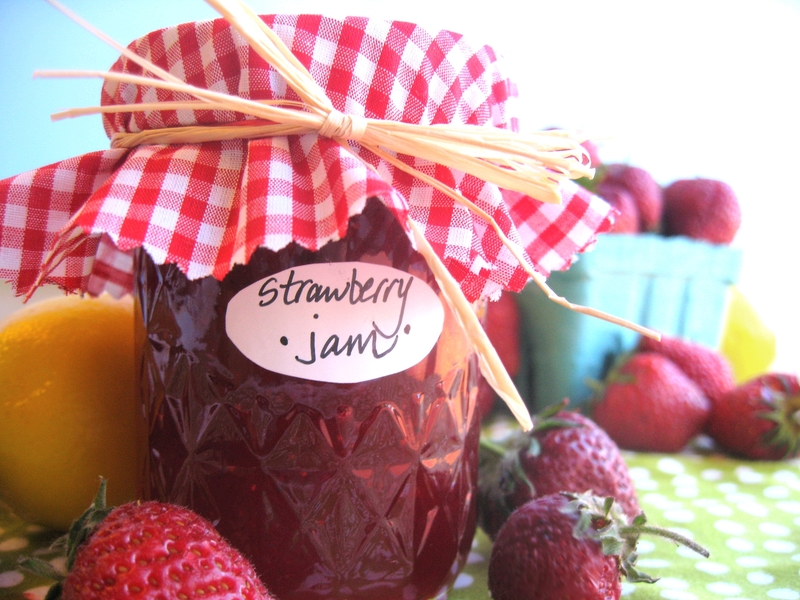 Since I like to can my garden I liked the strawberry jam posting. Honestly, it is tough to choose you have so many really tasty pictures.